Former WorldTour rider and British Road Race Champion (2005) Russell Downing is back in the game with the help of Phil Griffiths and Yellow Ltd.
After an illness hit season in 2018 and then his team folding, Russell Downing’s cycling career on the road was looking in danger. Severe danger but linking up with a former boss who helped him into a place at Team Sky has saved his passion for another season on the road. Russell is now on the other side of 40 but like another rider who Phil Griffiths helped keep pedalling in anger into his 50s, Malcolm Elliott, Russell has the class to compete with the best and this season he intends to do just that in the country’s top bike races. VeloUK spoke to Russell this week and whilst enjoying the warmth of a log fire after a cold morning ride, he confirmed that whilst there are lots of pieces of the jigsaw to organise, his ‘team name’ of one will be Giordana Racing. His main sponsor is Phil Griffiths of Yellow Ltd and the ‘Pinarello Experience’ in Mallorca, who has also sorted a bike for Russ, a Pinarello of course, as well as other products distributed by Yellow Ltd like the Giordana clothing, Rudy Project and Corima wheels. Just like many of Phil’s teams in the past when he was one of the stalwart supporters of the sport, there has been no panic in the process and the deal with Rus came about early in 2019. The details of the tie up are still being worked through and at the time we spoke, he’d just been told he’ll be racing on a Pinarello F10. Cue a smile from Rus who has raced on Pinarello a lot in his career. “Phil is doing me a massive favour to help me so I’ll probably also be in and out of Mallorca helping him promote the Pinarello Experience (Pinarello hire bikes and bike shop) as well” Russell explained. Russell’s sponsorship by former professional rider turned distributor Phil Griffiths is a smart move by ‘Griffo’ with Russell having such a high profile base in which to promote the brands that Phil represents especially with the passion for the sport Rus has and his experience of knowing what it takes to be a consummate professional. Even post 2018 season with no team insight, the Yorkshire rider known as ‘Fonzy’ has been putting in the miles. “Massively” he adds. “I just wanted to be more of a bike rider again after what happened in 2018 and that’s what I have done”. After he got on top of what was holding him back in 2018, Russell got stuck in on the road and celebrated a return to feeling good by winning the Out of Saddle National B road race organised by his and Deano’s ‘club’. “I was starting to go well again and that was nice to see” Rus says. “If’ Id not got over the illness, maybe it would have been time to hang up the wheels, but I never wanted to go out on a bad year so I was keen to race.” Russell had plenty of people and teams like Dave Coulson at Cycling Sheffield telling him he can’t stop racing his bike yet but as ever, it was raising the budget to pay someone to race full time that proved to be a stumbling block until Phil Griffiths came to his rescue. Russell has yet to confirm a calendar of events with his new boss but admits it will be different to what he is used to in the past with the major teams he has ridden for. “I’ve only just started to look at possible events but off the top of my head, the Eddie Soens Memorial (a race he won in 2012) may well be the opening race of his season. There are a lot of things to be done before then however”. 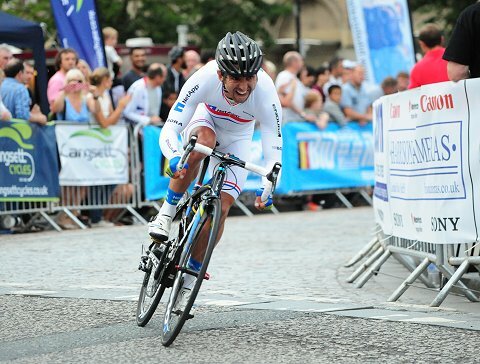 One of the events Russell does want to ride, is the one he’s won four times and is the joint record holder of with Paul Curran; the Lincoln Grand Prix. Russell says his morale is good and he’s been banging in over 20 hours a week since the new year so he’s in good shape. The chat then switched to looking back at his career. His rise to the top and my start in the business in this country, started around the same time. 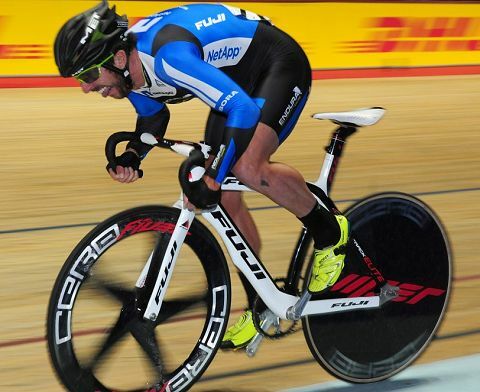 He was still a teenager and winning prems back then and when asked if, when it was uncertain if he would get the chance to continue racing, whether he went through the process of getting quite reflective about what he’s achieved, he says he did. “Sometimes you do just roll from one season to another and you forget where you have been so to look back and reflect on the classics and the Giro and first win with Sky (their first win) they were really good. And with Phil coming on board with me again, the memories from the Tour of Ireland come flooding back”. “That was one of the best wins of my career. I was second the year before after being worked over and despite being up there on the final stage, I lost the GC by seconds so to go back the year after and win it was great”. He adds though “there are some good victories in the past but I’m not ready to live on memories yet” adding there is time to make more memories. Working with Phil again is great for his morale for many reasons. Not just getting the opportunity to race again but being part of Phil’s ‘family’ again. 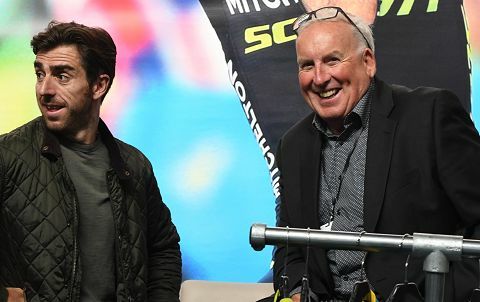 “When I went to pick up my bike, the first person I saw was Les West ( one of Britain’s greats of the 60s and 70s) and it was great to return there after six or so years and everyone at Yellow was really great when I walked in. It was a great feeling to be part of the family again. It was like Christmas all over again”. Okay, it’s a stupid question but when asked if Rus, eligible to ride veterans races now, is still hungry for the wins, he replies “if you don’t want to stop riding your bike, you’ll do everything you can to make it happen and I was trying to contact people and make them aware I really wanted to race. I am still putting in the hours and I still think I can give as good as anybody in a bike race and do other things for the brand”. “So I do mix it up, old and new. Ramp tests are still not my thing though! I think it was 1998 when I did one with GB and did a test and they said ‘that’s not a good result, if you don’t buck your ideas up, you’ll be off’ (the team), and so I went to the Tour of Morocco the next week and won two stages, and they were like ‘…. oh right’”. “There are certain things you need to do at certain times of the year but right now on a new bike, I just want to ride it and get it dialled in and then move forward. I have a training camp in a few weeks with some of Dean’s coached riders and I’ll do some specific drills down there, mixing it up and keeping it exciting. I didn’t do any warm weather training last year and as soon as the season came along, I felt dead and kept digging myself into the hole. So I have a few camps early season planned”. For now, not racing is not on his radar and with just over a month until the season gets going in March, we look forward to seeing Rus pedalling his Pinarello in anger …. but with a smile ;-) Good luck Fonzy!